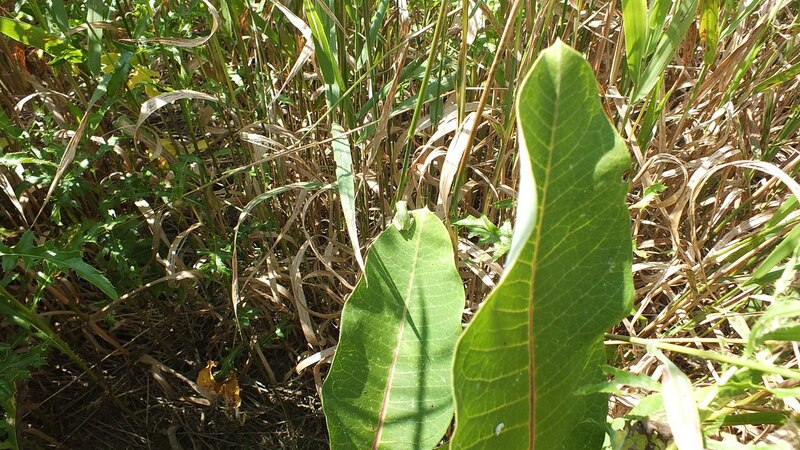 Along about mid-summer, Bob and I were interested in exploring some new wetlands that we had come to know about, and one of them was Atkinson Park Wetlands or McKenzie Marsh in Aurora. It is located near St. John’s Sideroad and Yonge Street. Bob and I were delighted to find a series of boardwalks that traversed a good-sized pond and wetland, and these conducted us to a paved trail adjacent to another smaller pond. 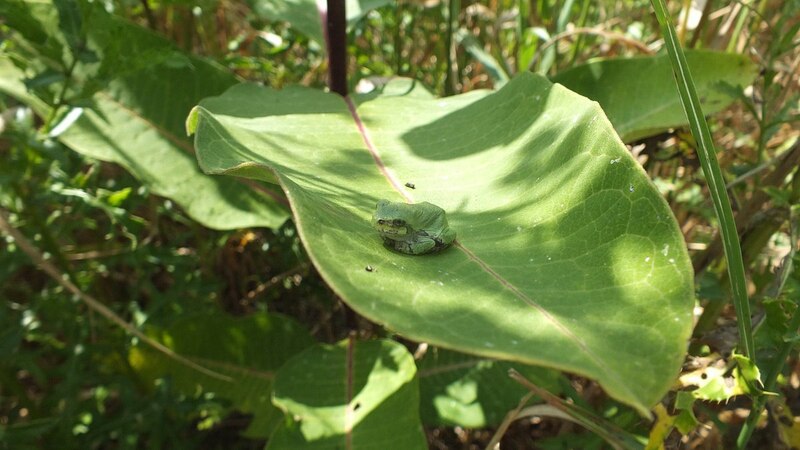 It is there that we came upon a Gray Treefrog (Hyla versicolor) sitting discreetly on a milkweed leaf. 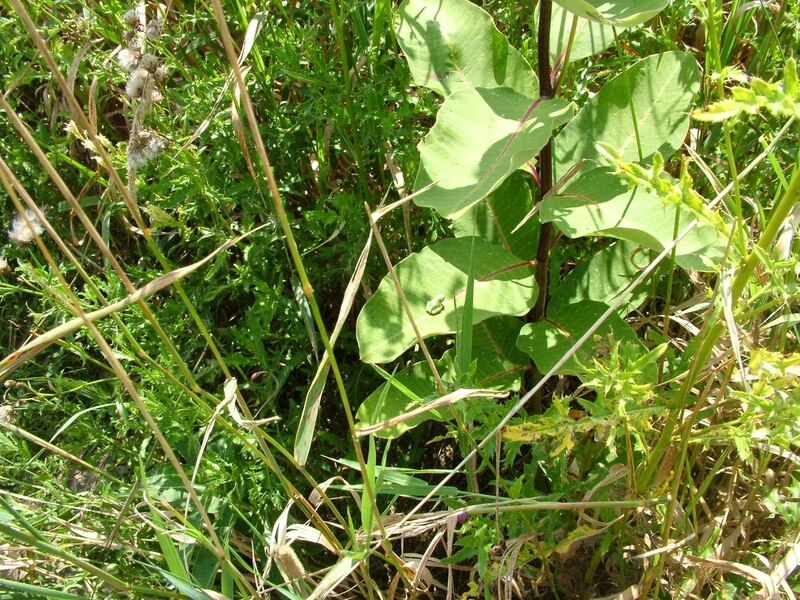 In truth, we had taken leave of the paved trail since it afforded little opportunity for seeing shorebirds and opted to follow an obscure cow path through deep grasses and meadow flowers in order to reach the edge of the secondary pond. 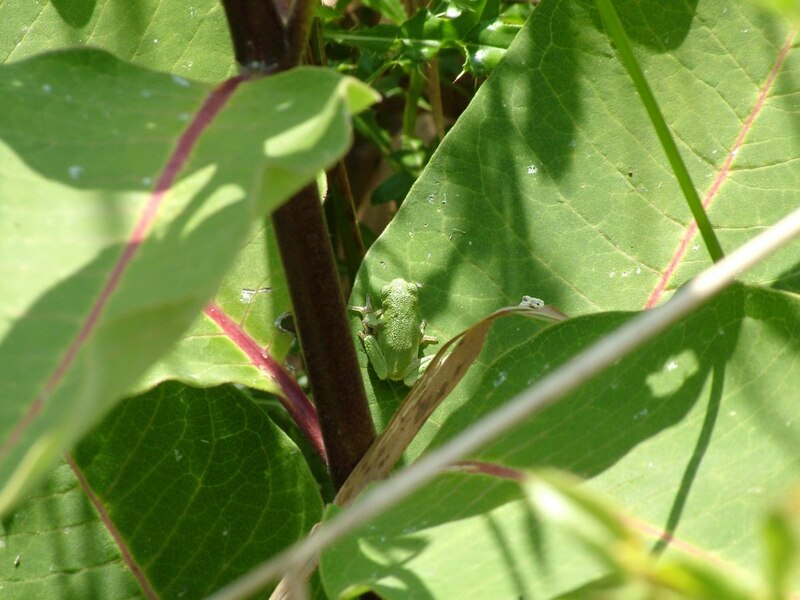 It was sheer luck that we noticed the Treefrog because it blended in perfectly with the pale green leaf. I am always keen to use the Macro and Super Macro feature on my camera, but this little frog would have none of it. 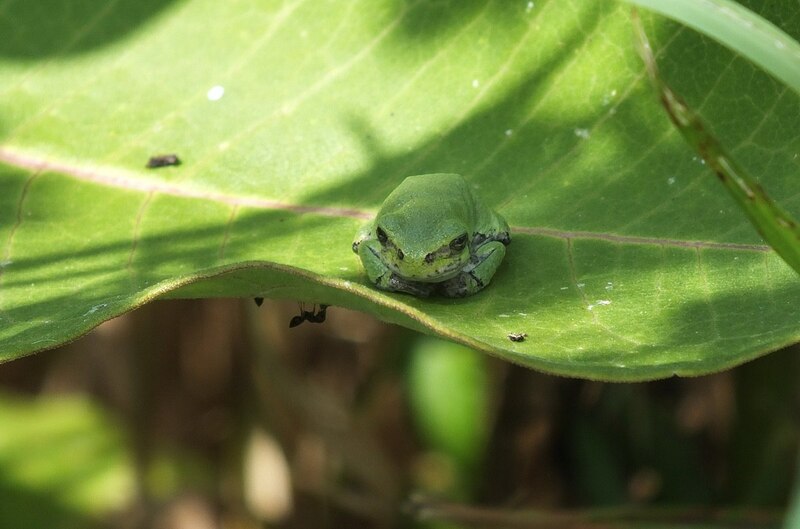 Every time I moved in for a close shot, the Treefrog darted for a far corner of the leaf and sometimes took to the underside of the foliage as well. 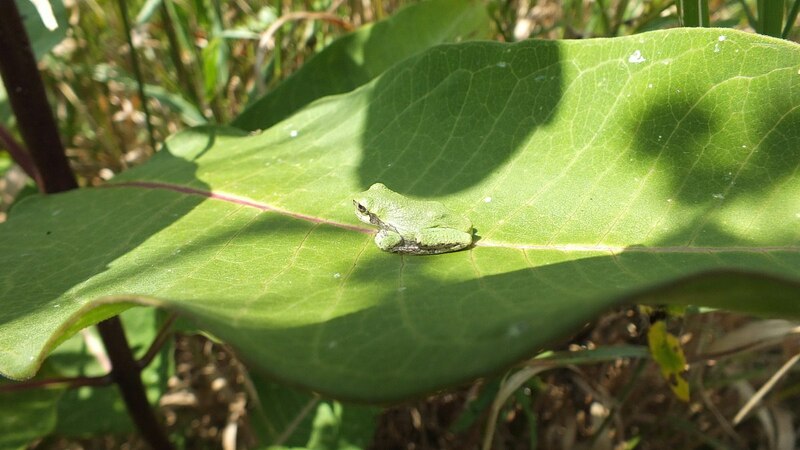 These arboreal frogs are much smaller than other North American frog species, several of which inhabited the nearby pond. Measuring between 1.5-2.0 inches (3.8-5.1 cm), Gray Treefrogs are not seen often because they are so tiny and often remain in out of the way places. 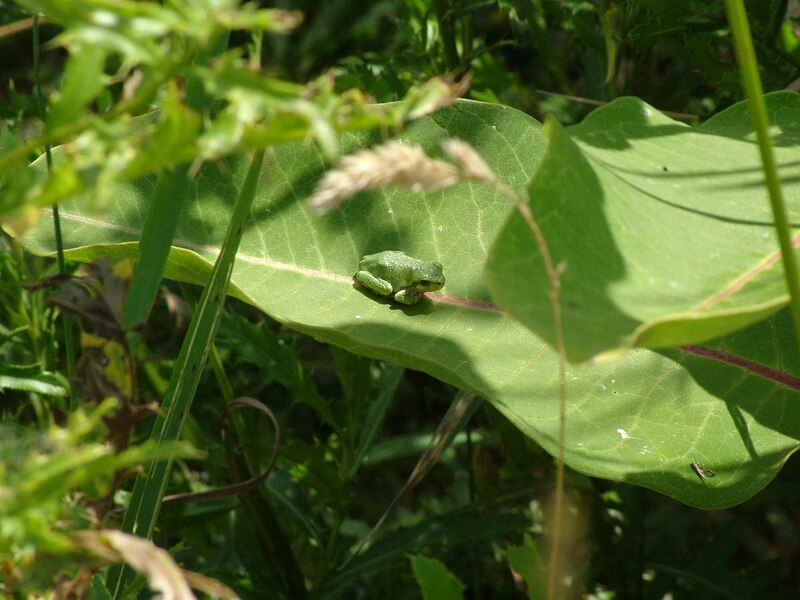 Wherever there is a temporary or permanent body of water, be it a swamp, pond, lake, flooded field, or suburban or rural woodlot, Gray Treefrogs can be found in the nearby trees and shrubs, which they inhabit anywhere between the roots and the crown, depending on the time of year or hour of the day. Eastern Gray Treefrogs are true “tree frogs” because they rarely descend from high treetops except during breeding season, between April and August, or to overwinter under leaf litter, bark or rocks on the forest floor. Being nocturnal, it is at night that these frogs crawl along branches and leaves in search of insects to eat. A good variety of creatures makes up their diet, everything from moths to beetles, spiders and snails, crickets, grasshoppers, ants and flies. Because these frogs descend from the trees during breeding season, they also will forage on the ground and in low vegetation. It is during the day that Eastern Gray Treefrogs seek rest on tree branches or even leaves totally exposed to the sun, as we observed. When they are inactive, you might also find them hiding in tree hollows, beneath bark, inside damp, rotten logs, or even under leaves and tree roots. 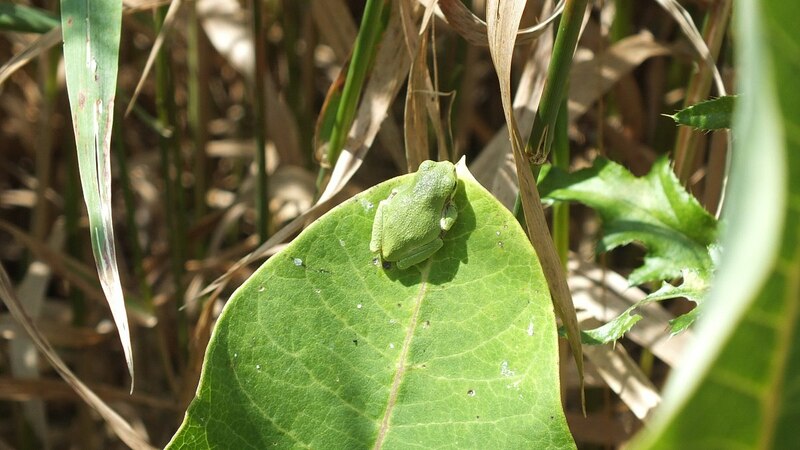 It seemed odd to me than an Eastern Gray Treefrog was green, but then I learned that, during breeding season, it is more common for them to be green rather than the typical grey with black blotches on the back. As their Latin name suggests, they are chameleon-like so can change their colour to brown, multiple shades of gray or of course green to suit their environment. 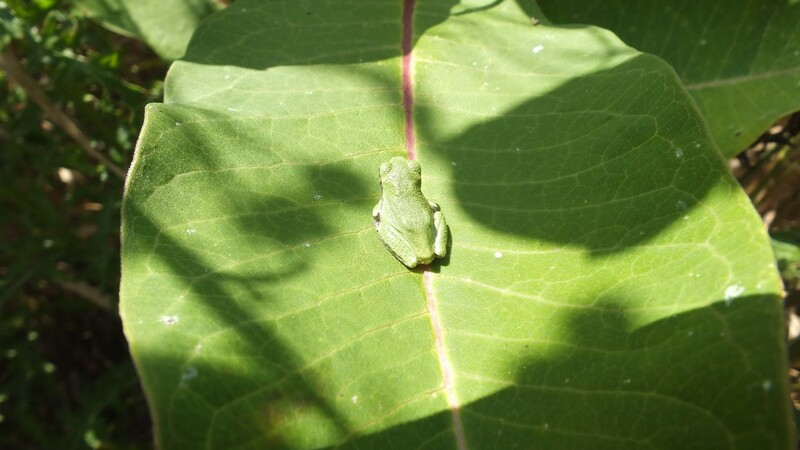 Bob and I left the little Treefrog where we found it, and it seemed content to continue basking in the sun. It was the second time this year that we had come across this diminutive species of amphibian, so we were quite thrilled with this newest discovery on our walkabout. Then, it was on to the pond that was literally brimming with frogs. It was quite a day.